Hello. 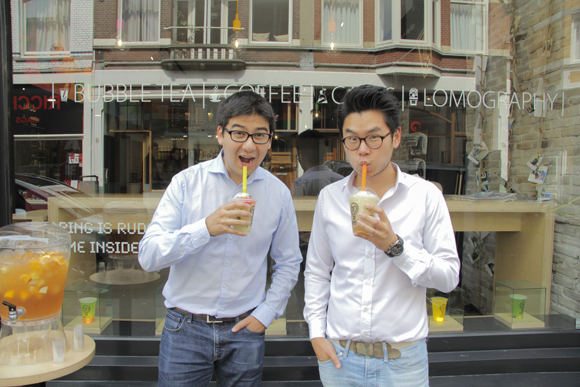 We are Herdjie and Joram and we are obsessed with quality and bubble tea. The Inspire Food Company was established in 2013 to bring you the highest quality bubble tea ingredients and its related products on the market. We’ve started our own bubble tea chain store with the goal of serving customers products we take great pride in. To make sure we provide excellent quality we have travelled to countries such as Taiwan, China, India and Japan to see, feel and taste the products. We carefully select and test each ingredient before it goes to market. We work with partners that share our values of distributing honest and responsible products. We raise our standards by knitpicking about details of the products’ ingredients, production processes, plant audits and complying with EU food and drug laws and regulations. We know the importance of great customer experience with the opening of our successful stores. It allows us to connect with customers, like you. Let us know if you have any questions or how we can help to empower your business.